Born in the small border town of El Centro, California,the activist and artist, Ernesto Yerena Montejano, grew up regularly visiting his family in Mexicali, which is near the border, and crossing the border, which gave him a unique cultural outlook. 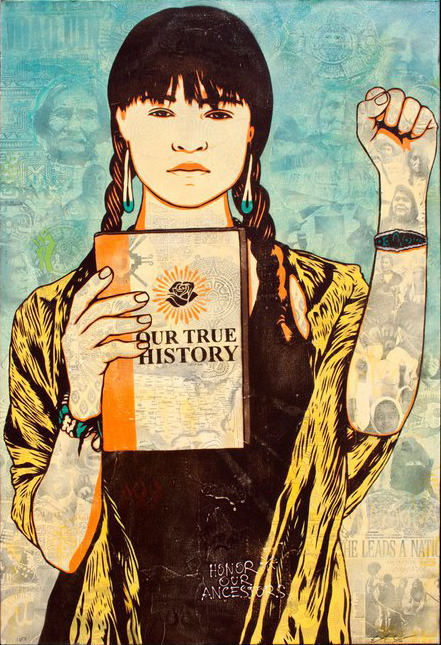 Receiving a BA in Graphic Design, Montejano uses stencils, collages and rubyliths to highlight cultural subjects and issues in the Chicano community. The colors he uses in his artwork ties into the ancient civilizations of his ancestors. Last year, he premiered his first solo show at White Walls gallery and the exhibition was based on a Montejano’s story detailing a fictional revolutionary movement called GANAS 2020, whose an ideology of reform, empowerment and motivation (the word “ganas” means desire and motivation). Besides White Walls, Obey Giant also supports his work. For more information on Montejano, you can follow him on twitter, tumblr, facebook and his website.